Nothing is more important to the brilliance and sparkle of a diamond than its cut, as it is responsible for around 40% of a diamond’s price. The clarity of a diamond refers to the number and nature of inclusions or blemishes that are visible when you view it under a microscope. A blemish is an imperfection on the surface of a diamond, and an inclusion is a small spot contained within it. Diamonds with little or no imperfections such as these are rare, and much more valuable. 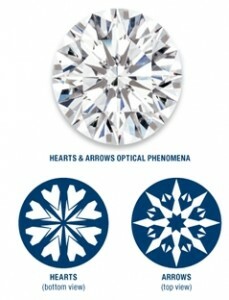 Five factors determine a diamond’s clarity: the size, number, position, nature and “relief” of the inclusions. Relief describes the level of visibility of these imperfections. 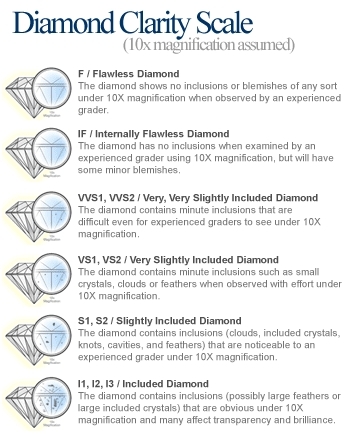 The clarity scale of a diamond is the easiest to understand: It varies from Flawless, to Internally Flawless, and from their goes to VVS, VS, SI and I. These are easy to understand and remember, because they stand for: Very Very Slightly included, Very Slightly included, Slightly Included, and Included. Each of these designations has varying levels as well, but getting a handle on these will help you understand the importance of clarity in a diamond’s grading. 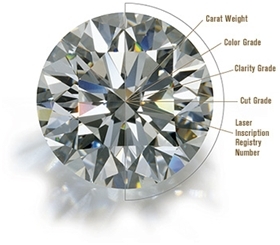 An “I” rated diamond will have inclusions that are visible to the naked eye, whereas even a skilled diamond expert would need a microscope to see the inclusions in an “SI” diamond. 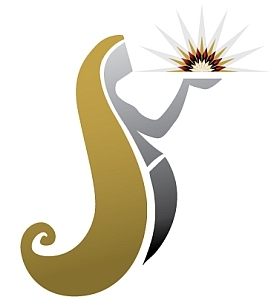 Because of this, diamonds rated “SI” usually represent the best value for your investment. When examining a diamond, be sure to view it “loose” (unmounted) under a neutral light source, to get the best view of its colour. In the “normal colour” range, the colour of a diamond is rated on a scale that goes from D to Z, with D being the whitest diamond available, and Z being a tinted, light yellow colour. For most jewellery, a colour grade from G to J is usually best. 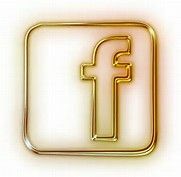 Why “D to Z?” Before this rating system was invented, diamond professionals used many other symbols (including liberal uses of “A” and “AA”) to rate colour, so the creators of the new system started at D, to avoid any confusion with the outdated ratings systems. 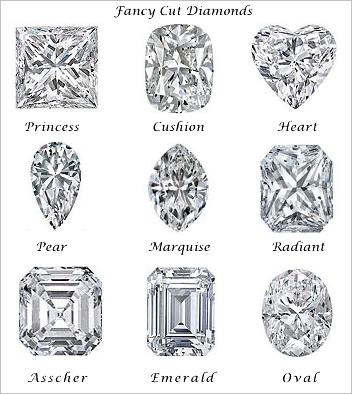 There are also various coloured diamond choices available today, but when you are looking specifically at a white diamond, you should understand how this scale works, and where your diamond of choice is rated on the spectrum. Also, the mounting of a diamond can impact its appearance. A more yellowish diamond will appear whiter next to a gold setting, whereas a white gold setting will make the diamond look less pure if you compare the two side-by-side. Sometimes one carat is referred to as 100 “points”. A 0.50-carat would then be the same as 50 points or 1/2 carat. This is the easiest factor to determine. However, weight is related to but is not the same as size. Two diamonds of the same shape cut from the same rough (with equal carat weight, colour and clarity) can be different size depending on how well they have been proportioned. The better-cut diamond will appear bigger than a less well-cut diamond! 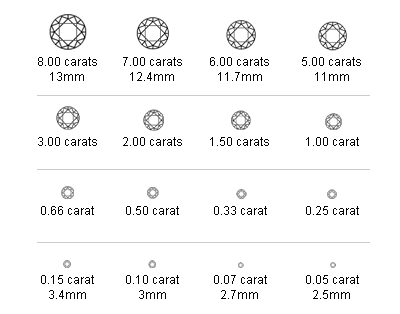 Also as diamond prices go up exponentially with carat weight, doubling the carat weight from say 1 carat to 2 carats more than doubles the price, but the visible size of the table (the largest surface at the top of the diamond) goes up by only by ca. 30%. As about 50% of the rough diamond is lost when cutting, the larger the diamond the rare it is in nature hence the price increases most steeply with carat. Approximately 250 tons of ore must be mined and processed in order to produce a single, one-carat, polished, gem-quality diamond.